It is easy to tie almost any vocabulary into Thanksgiving activities. After all, we are thankful for family, food, community helpers, our bodies, and many other things that children learn the words for in Spanish. 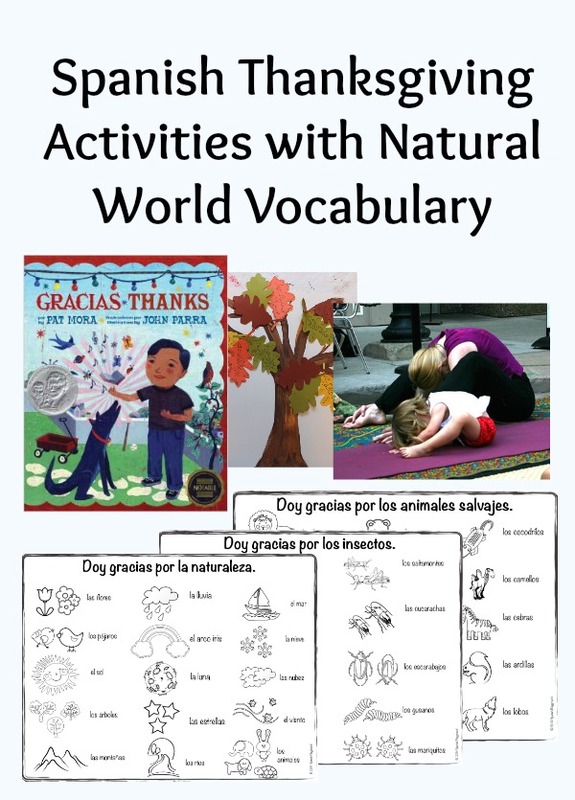 These Spanish Thanksgiving activities teach children vocabulary related to the natural world. These new coloring pages are good Spanish Thanksgiving activities for language learners. The pages Doy gracias por la naturaleza, Doy gracias por los insectos, and Doy gracias por los animales salvajes have simple pictures labeled in Spanish. They help kids express what they are thankful for and learn new vocabulary related to the natural world. Use the links below to download these Spanish Thanksgiving activities. You can find Thanksgiving coloring pages with more vocabulary here. In another post, there is a Thanksgiving coloring page with transportation vocabulary. Doy gracias por la naturaleza. Doy gracias por los insectos. Doy gracias por los animales salvajes. Yoga is one of my favorite Spanish Thanksgiving activities to do with kids. KidsYogaStories has a wonderful Thanksgiving yoga sequence. The poses are all related to the natural world. Follow the link to find the description of the poses. This is the vocabulary you need to do the sequence in Spanish. Yoga is an excellent language learning activity because kids act out the words and that reinforces the meaning. Also, movement enhances learning. AllDoneMonkey created a fabulous Thanksgiving game called Journey to the Gratitude Garden. Read about how to play the gratitude game in Spanish. It involves two Spanish Thanksgiving activities, a craft and then acting out the journey. The structure of the game includes this vocabulary from the natural word: el árbol, el jardín, el bosque, el pantano, la montaña. Also, as part of the game, kids need to call out things they are thankful for, so they use personalized vocabulary too. Reading and talking about stories are wonderful Spanish Thanksgiving activities. The lovely picture book Gracias by Pat Mora has lots of key vocabulary that relates to the natural world: el sol, la mariquita, el grillo, las olas, el gusano, la luna. Sol y Canto have recorded part of the book Gracias on YouTube. The book is dual language, and the recording has both the Spanish and the English. The book is available in many libraries and also from Amazon. Thank you for all these amazing resources. I’m just starting out and your printables were the best I’ve seen! ¡Siempre puedo contar contigo!! Gracias a todos que contribuyen a SpanishPlayground.net. © 2019 Spanish Playground All Rights ReservedCreated by Meks. Powered by WordPress.